Soundbars are the kings of convenience, stepping in for your tinny TV speakers and bringing pseudo surround sound from a single sleek unit (plus separate subwoofer). The black Samsung HW-H750 (and silver HW-H751) do it in style too, with metal grills and glowing vacuum tubes giving an audiophile feel. A step up from the HW-F551, this flagship uses no wires between the sub, speaker and TV and NFC adds one-touch Bluetooth connection to your smartphone too. That's a feature even the slinky Sony HT-ST3 and similarly priced Sonos Playbar cannot match. For a wall-mounting soundbar, the Samsung is sizeable at 943x120x57mm, but its flat enough that it won't protrude much farther than an LCD TV. It weighs a substantial 3.3kg too because that grill is metal and it's packing four amplified speakers. The subwoofer is even bulkier at 305 x 401 x 305mm and 10.6kg, but with low frequencies being omnidirectional, you can slide it out of direct sight if you prefer. With the glowing valves, crisp metal finish and options of a black, or silver, the Samsung soundbar scores well for build quality. Samsung's soundbars have evolved beyond simply substituting the underpowered sound of your TV, to forming the hub of a pseudo home cinema. You can link it to your TV via Bluetooth for a very neat wireless setup if your TV is up to it. Otherwise there's an HDMI input and also an output for looping through the sound and picture from an external source. We should point out that these HDMI ports can handle 3D 1080p, but cannot pass a 4K signal. Thanks to NFC, you can also connect your smartphone wirelessly with one tap on the soundbar. It's a neat trick, but without AptX, you should be aware of the lossy compression and limited range of Bluetooth. An alternative is to jack directly into the conveniently located USB 2.0 port on the top of the bar. That way you can charge your phone at the same time. You'll find the brackets you need to wall mount this speaker inside the box, but for heaven's sake use a spirit level, or it will look silly. From the box, the soundbar made it's own wireless connection with its subwoofer sidekick with no intervention from us. Connecting via Bluetooth to the TV is potentially more complicated, especially if it's not also a Samsung, but thankfully, there is an excellent app for that. Samsung's free 'MultiRoom' app takes you through a step-by-step guide until your phone, TV and speaker are all talking to each other. But why stop there? With AllShare it can also stream MP3, or even FLAC files from your tablet or PC. If you are looking to beef up the sound from your TV, but not prepared to fill your designer flat with speakers, this could be just the thing. From its perch on the wall, or squatting on a TV table, the Samsung HW-H750 fill a room with a resonance and bass presence that TV speakers can only dream of. It doesn't have the scale and stereo imaging of freestanding cabinets, but it does project well and seriously increases your decibel level. The subwoofer adds plenty of bass weight and depth – enough to shake the room when required – but it did cause us to turn the level to below that of the soundbar to stop it swamping the dialogue. Get the balance right and it's a satisfyingly warm tone that validates the choice of using vacuum tubes for amplification. They're not just there to look good. What it doesn't quite achieve, is convincing surround sound. You have four separate channels in the front array, which attempt to bend the sound around you, but really just adds an enhanced sense of depth. We would also have preferred a little more sparkle from the treble to help pick out the more subtle detail. As it was, we found ourselves choosing 'voice' from the list of DPS modes to get more clarity into movie soundtracks. 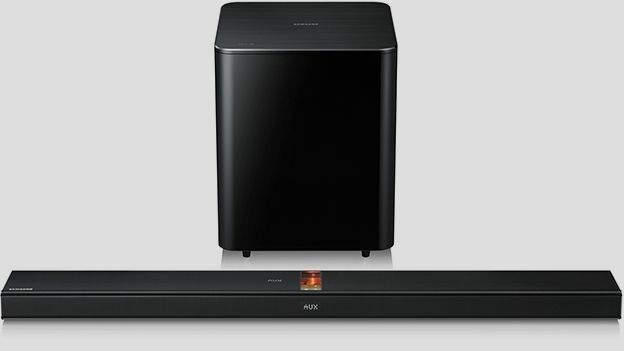 On paper, the Samsung HW-H750 goes beyond its remit by seriously upgrading the sound of your TV, while offering wireless connectivity between every component and even NFC sharing for similarly equipped smartphones. It looks stylish, especially with its glowing valves, and it's a synch to use too. The surround effects aren't enough to have you looking over your shoulder and we'd prefer a little more bite in the treble, but others will enjoy the warm and fuzzy tone.